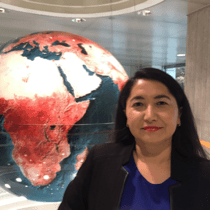 Sibel Kulaksiz is a Senior Country Economist with the World Bank where she works at the Global Practice for Macroeconomics, Trade and Investment. She is task-managing macroeconomic policy work with a focus on economic growth, fiscal policy and management, and regional economic integration issues. Kulaksiz is the lead author of many World Bank publications including “Over the Horizon: A New Levant,” a sub-regional economic integration vision that proposes comprehensive economic and social development reforms and multi-country investment projects to benefit from significant untapped economic potentials in the region. She provides policy advice to governments in the areas of economic policy, trade competitiveness, and public spending efficiency. Kulaksiz is also experienced in post-conflict stabilization operations with a focus on addressing economic and humanitarian impacts of conflicts and refugee flows. Previously, she worked as a Country Economist in the Africa region leading analytical and operational work. Prior to joining the World Bank in 2001, Kulaksiz worked in the Turkish government. She holds a master’s degree in Economics from Hacettepe University as well as a master’s degree in International Development from Johns Hopkins University.